especially during a long and terrible greek gothic war, which was fatal for the populations of these places. All this territory become a battlefield, with a series of raids and ravages of byzantine and gothic armies. The people who escaped the ravages of war arrived to the surrounding hills, which were more defensible and secure, and they built the first fortified settlements around which many medieval castles developed and they are still today centre of Massa Martana. Every year Massa Martana is famous especially for his Ice crèche, where this year the Francis Pope’s statue will appear. 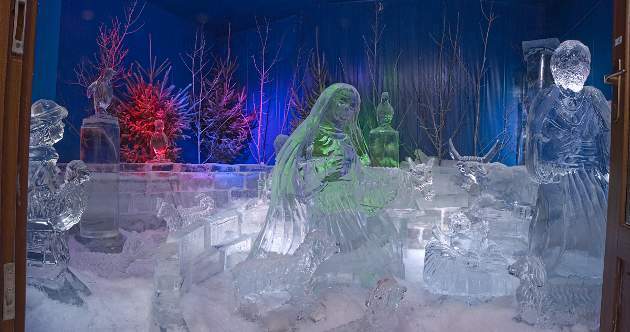 It is an unique and spectacular nativity scene with life-size statues, carved out of large blocks of ice that glow as if they were made of crystal . But beyond this crèche, which is one of the most characteristic and particular in Italy, you will see many other beautiful crèches, which come from all regions of Italy, as well as the masterpieces of great sculptors and potters, and artistic works about the nativity, to rediscover the magical atmosphere of Christmas. The program of the exhibition is also rich in events for children and adults, such as the appointment at Santa Claus’s home, with gifts and surprises, Christmas music through the streets of the center, clowns shows, stilt walkers, jugglers and concerts. All elements that make you feel the Christmas spirit between colours, lights, sounds and scents in one of the jewels of Umbria. This entry was posted in Upcoming Events, Italy and tagged borghi e presepi, borghi umbria, christmas festivals, eventi natalizi, hotels massa martana, hotels umbria, vacanze massa martana, vacanze umbria, villages and crèches, villages in umbria. Bookmark the permalink.